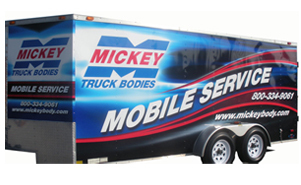 That may be a little too long for a slogan on the bottom of a business card, but it does just fine as the promise behind Mickey Truck Bodies’ Mobile Service Program, says Larry Jacobs, Mickey Customer Service Representative. Mobile Service Unit is available 24/7 and will travel as far as necessary. The Mobile Service Program features 2 dedicated trailers manned by a 2-member crew of full-time, fully-trained Mickey employees, including a certified welder. “The program is designed to provide on-site assistance and repair that requires specific Mickey expertise at the customer’s facility,” explains Jacobs. The crews are available 24/7 and will travel as far as necessary, although longer trips may require air travel in lieu of the mobile unit. Recent calls have sent the mobile units to customer facilities in Boston, Birmingham and St. Louis. For more information on Mickey’s Mobile Service Program, contact Larry Jacobs at 336-888-2218.